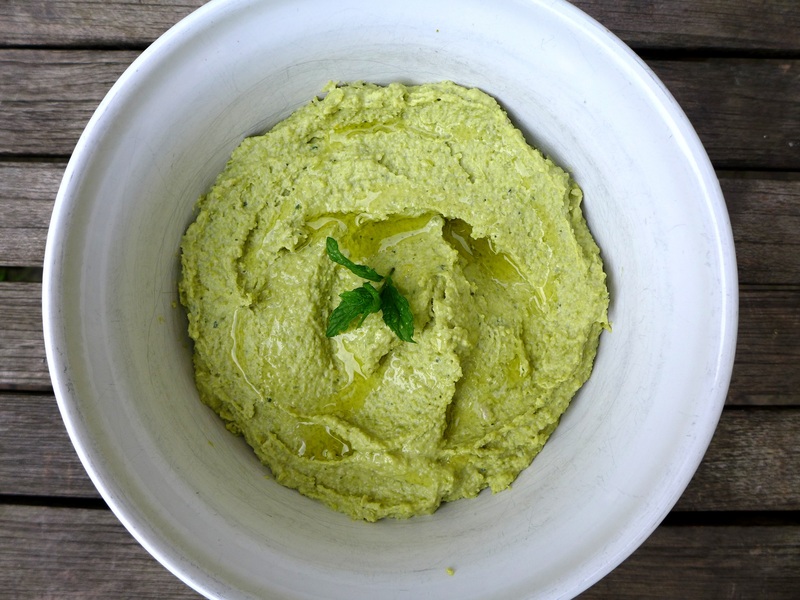 This is a lovely, fresh alternative to regular hummus and it’s a good way of using those tough old broad beans that have been hiding under the leaves until they’ve got big and mealy, although of course you can use tender young beans or indeed frozen ones. I had 950g shelled weight which sounds like a lot, but there was rather less when I’d double-podded them. And yes, I’m afraid you do need to double-pod for this recipe, especially if the beans are old, for the colour and because the skins can be bitter. I actually find the process quite therapeutic. I only used a little tahini as I wanted the flavour of the beans to shine through, but you can add more, or leave it out altogether if you prefer. Reduce all the ingredients pro rata if you’re making less than the quantity given, but taste as you go and tweak according to your personal preference. Bring a pot of water to the boil and cook the beans at a steady simmer for 10 minutes or until tender. Pour into a sieve and run cold water over them to arrest cooking and make them cool enough to handle. Slip off the skins and put the beans in a food processor with the remaining ingredients except the salt. If the tahini has separated in its jar, whisk it with a fork to bring it back to a smooth paste. Whizz the mixture until you have a puree, or stop a little earlier if you want more texture. If it is too thick, loosen it with more oil. Add salt to taste and if you’re not using it straight away, store in the fridge, covered. To serve, scoop it into a bowl, swirl the top with the back of a spoon and drizzle with a little more olive oil. Garnish with a sprig of mint. Good with hot pitta breads. This entry was posted in In the garden, Soups, starters and canapes, Vegetables and salads, Vegetarian and tagged broad bean hummus, broad bean recipes, dips by Linda Duffin. Bookmark the permalink. Very elegant. The progression of photos from your theme to the bowl is excellent. Even if it is unintentional, it works! Good it is. You were being subliminal…. Great use of a garden’s excess. 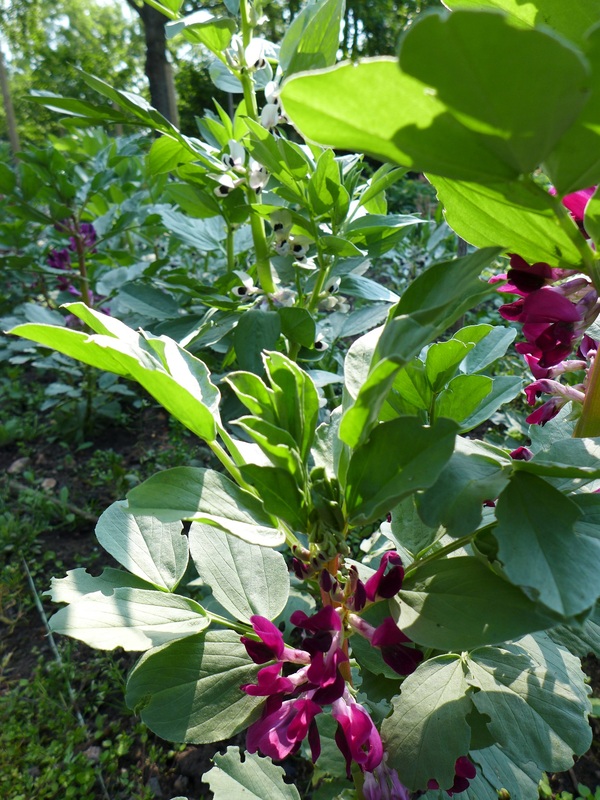 I’ve mentioned elsewhere that the only way broad beans were served during my youth was raw. They weren’t even removed from the pods but served as-is. 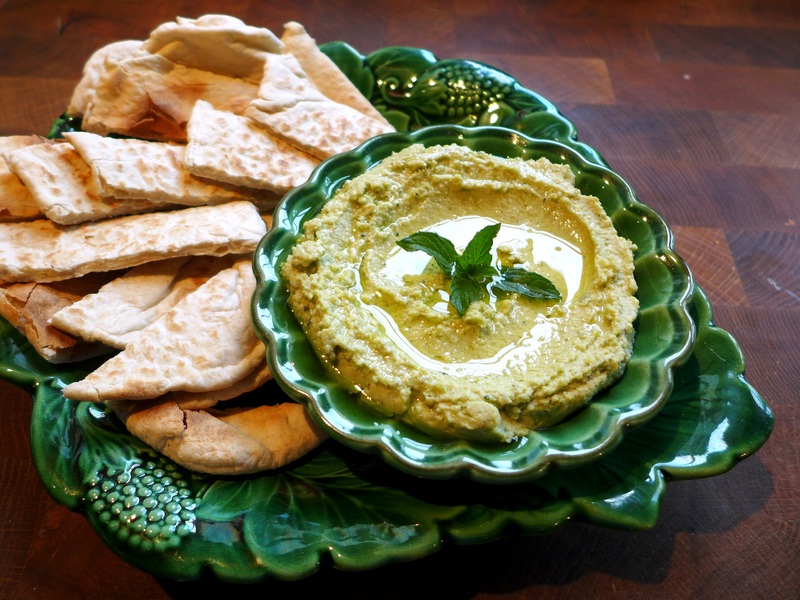 I really should buy some and give your hummus or any one of the dozens of cooked broad bean recipes a try. Well, once I get my fill of them raw. I so rarely have fava now and they’re quite a treat when I do. I’m pretty much a stick in the mud when it comes to cooking. I stick to the tried-and-true and don’t think much of innovative dishes. But there is one kind of creative dish I do like, which is taking a classic technique and using it on a different ingredient for a result that’s both familiar and new. Just like this recipe. And it looks exquisite! Thank you, Frank. I’ve made this before with dried broad beans but fresh ones (I think they’re called fava beans in the US?) are much nicer! Cheers, Linda.